We are excited to announce a 60-day free trial of the digital Loeb Classical Library. This trial began on September 17 and will end on November 17, 2014. 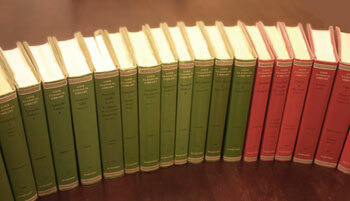 Since 1912, the iconic Loeb Classical Library volumes have been enjoyed by students, scholars, and others else interested in ancient Greek and Roman writings. The books in this series are well known for their red and green covers and their presentation of classic Greek and Latin texts with an English translation on facing pages. There are over 500 volumes in this series and now they have been digitized and made available to Emory students, faculty, and staff here. This means that you can read Homer’s epic stories, Plato’s presentation of Socrates, or one of Cicero’s great speeches in a reliable text and translation from your computer or other device. The digital series makes accessing these collections more convenient, but the content is exactly the same as the printed books. We hope to get your feedback during this trial period, which will help us make the decision about permanently adding the digital Loeb to Databases @ Emory. You can send comments about this trial database to the Classics Librarian, Kim Collins. And if you still prefer the traditional pocket-sized book format, we have you covered because both Woodruff Library and Pitts Theology Library contain complete collections of the Loebs in their printed editions. I really hope Emory decides to get permanent access! Many of us are researching the same things, and often there are not enough copies of the Loeb to go around. Jonathan, good news, the digital LCL has already been approved.